Airs Thursday, April 25 at 9:00 on NBC. NBC has released the synopsis for the May 2 episode of Brooklyn Nine-Nine, "Return of the King". Chelsea Peretti makes her first guest appearance as Gina in the episode. "Return of the King" - 05/02/2019 (09:00PM - 09:30PM) (Thursday) : When Gina returns to the Nine-Nine, Jake and Terry get drawn into her life. Holt learns that Charles's son, Nikolaj, may be a genius. Rosa copes with an injury. NBC has released the synopsis for next week's episode of Brooklyn Nine-Nine, "The Therapist". 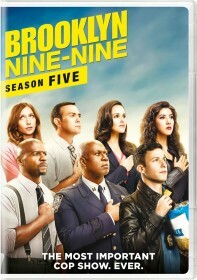 The sixth season of Brooklyn Nine-Nine will premiere in the United Kingdom later this month, E4 has announced. New episodes will air Thursday nights at 9pm from March 28. The sixth season begins with "Honeymoon", in which Jake and Amy go on their Honeymoon and Captain Holt finds out whether he got the commissioner's job. E4 has been the U.K. home of Brooklyn Nine-Nine since it aired the first season in 2014. 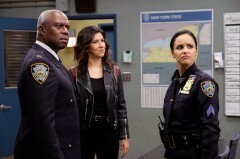 NBC has renewed Brooklyn Nine-Nine for the 2019-20 season, bringing the show back for its seventh season overall and second on its new network. Since its NBC premiere on January 10, Brooklyn Nine-Nine has averaged a 1.4 rating in the key adults 18-49 demographic and 3.9 million viewers overall in the Live Plus Seven ratings. The show has added 1 million viewers from its average this time last season on FOX. Brooklyn Nine-Nine has one of the most digitally driven audiences on the NBC schedule, with 45% of the show's Live Plus 7 Plus Digital audience in the 18-49 demo coming from non-linear sources. "It's been one of our great joys as a network to give 'Brooklyn Nine-Nine' a second life," said Lisa Katz and Tracey Pakosta, Co-Presidents of Scripted Programming, NBC Entertainment. "Cheers to Dan Goor, Mike Schur, Luke Del Tredici and David Miner, and our amazing cast and crew who each week turn New York's finest into New York's funniest." After a five season run on FOX, the network cancelled Brooklyn Nine-Nine last May. Within days, NBC, whose sister studio Universal produces the show, stepped in to save the show. Brooklyn Nine-Nine's sixth season airs Thursdays at 9/8c on NBC. NBC has released the synopsis for the March 14 episode of Brooklyn Nine-Nine, "Gintars". 03/14/2019 (09:00PM - 09:30PM) (Thursday) : A visitor from Latvia causes Charles and Jake to investigate Nikolaj's family. Holt and Amy bring in famed forensic scientist Dr. Yee to help close a case for Rosa. NBC has released the synopsis for the March 7 episode of Brooklyn Nine-Nine, "The Golden Child". Hamilton creator Lin-Manuel Miranda, who declared his support for the show when it was briefly cancelled last year, will guest star as David, Amy's brother. 03/07/2019 (09:00PM - 09:30PM) (Thursday) : Jake helps Amy navigate the complicated relationship she has with her brother, David. Charles introduces some drama into an undercover mission involving Terry and Holt. NBC has released the synopsis for next week's episode of Brooklyn Nine-Nine, "He Said, She Said". This replaces the previously scheduled episode, "The Therapist". 02/28/2019 (09:00PM - 09:30PM) (Thursday): Jake and Amy investigate a difficult "He Said, She Said" case. Holt becomes suspicious after learning his lifelong arch nemesis died in a prison transport accident.